Most of the columns have six sides but many vary from the basic plan. The Giant’s Causeway is an impressive geological formation on the shore of Northern Ireland which looks just as amazing in person as it does in all the photos. The first question most visitors ask is why is this here? We heard two answers on our recent visit. Geologists say that a prehistoric lava spill created a huge bed of basalt. 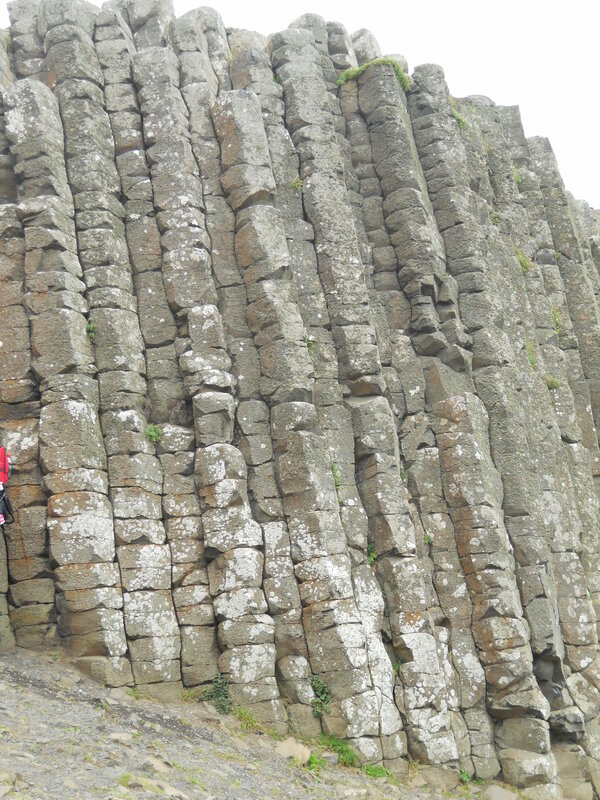 As the lava cooled it formed the hexagonal columns typical of basalt crystals. As the bed has weathered over the centuries the columns have been laid bare, creating the unique formations we see today. The formation extends into the sea and is visible also at the oceanfront Fingal’s Cave on an island in western Scotland. The columns create a huge playground worthy of exploration. That is one explanation. The Irish have another. The giant Finn McCool (Fionn Mac Cumhaill in Gaelic) was walking on the shore of his domain in Ireland one day when he spied a figure far off on the distant shore in Scotland. Curious about what kind of human could be visible from so far away, he decided to investigate. He started picking up the stones that lay around him, tossing them into the sea to form a bridge. Before long he was able to walk to the other shore. Many columns have broken into ‘biscuits’ with complimentary convex and concave surfaces at the joining. The closer he got the more amazed he was; the Scottish giant was twice the size of Finn McCool! Frightened to consider the strength of the other giant, Finn ran quickly back to his home in Ireland. When he arrived home he told his wife what he had seen, and said he was afraid the other giant might come after him. Finn’s wife just shook her head, told him to get into the baby’s cot and to keep quiet. She would do the talking. Mrs. McCool replied, “He is not here now but will be back shortly. Please speak softly or you will wake the baby.” She showed him “baby” Finn lying in the baby’s crib. 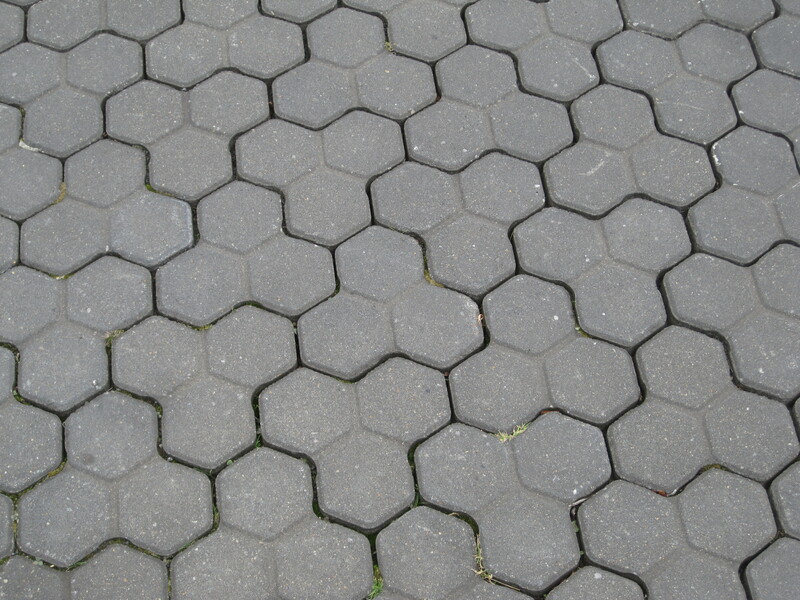 Even the pavement at the visitor center forms hexagons! The giant thought to himself, “If this is the baby, how big is the father?” Frightened at the prospect, the Scottish giant ran back over the causeway Finn had created, tearing up the stones as he went! So that is really how the causeway was formed – and broken apart. Which story do you prefer? 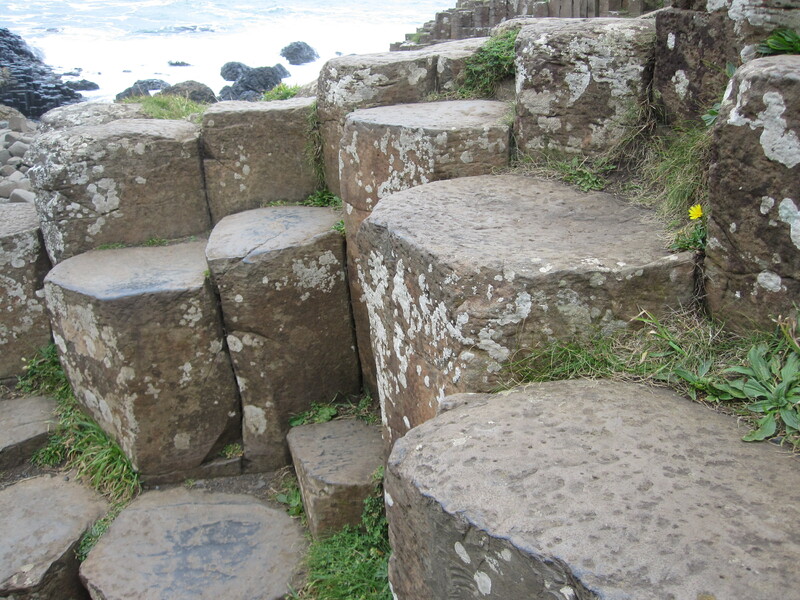 Regardless of its origins, the Giant’s Causeway is a dramatic site, inviting the imagination! 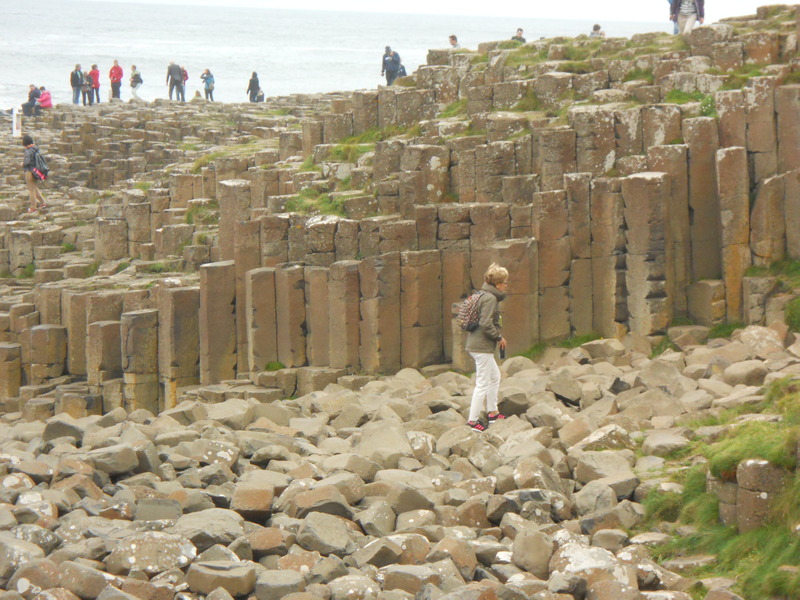 This entry was posted in Travel, Uncategorized and tagged basalt, Finn McCool, giant, Giants Causeway, Northern Ireland, travel. Bookmark the permalink.